It’s official: Hamilton creator Lin-Manuel Miranda has cut his hair and shed the persona that’s given him a stickily viral cultural presence for the past two years. Saturday night, Miranda, along with actors Leslie Odom Jr. and Phillipa Soo, took a bow in their final curtain call together at Richard Rodgers Theatre in New York. Among the projects in Miranda’s future? He’ll be starring as Jack opposite Emily Blunt in the new Disney film Mary Poppins Returns, set to come out Christmas Day in 2018. The show is changing, but it’s been preserved, with its original company (including Jonathan Groff as the hilarious foppish King George) for posterity. Miranda confirmed last month that the show would be filmed before his departure. For those who can’t afford tickets to the Broadway show or to one of the productions on its 12-city national tour, there’s still hope. Leslie Odom Jr., who won a Tony for his portrayal of Burr, is starring as Jimmy Jam in the BET miniseries New Edition: The Movie. He also released a terrific self-titled jazz album on June 10. Soo is going to star in the new Amelie musical on Broadway, which is expected to open on Broadway in spring 2017. And if you’re just itching to hear more of Miranda’s musical compositions because you’ve worn out the Hamilton cast recording, Moana, the Disney animated film starring Dwayne Johnson, arrives Nov. 23. Muñoz, who was Miranda’s alternate, gets a promotion to playing Hamilton full time, but he’s no stranger to Hamilton audiences, who saw him in the titular role when the show was still at the Public Theater before moving to Broadway. When the President Barack Obama and first lady Michelle Obama first saw Hamilton, it was Muñoz they saw in the role, and Michelle Obama raved about it. Muñoz is an alumnus of Miranda’s first Broadway musical In the Heights. There too, he was Miranda’s alternate, and then his successor. Shuffle Along producers decided to close the show early, in part because they didn’t think they would be able to draw enough of an audience without its star, Audra McDonald, who announced earlier this year that she would have to take a leave because she is pregnant. It’s a shame that the last day for the show will be July 24, because McDonald has wonderful chemistry with the Tony-nominated Dixon, who plays her love interest Eubie Blake in Shuffle Along. But the unanticipated early closing presented a great opportunity for Dixon, also a veteran of the original Color Purple Broadway production. If there’s anyone who’s up to crafting a version of Aaron Burr that’s just as compelling as Odom’s, it’s Dixon. Muñoz and Dixon will be joined by Lexie Lawson, who becomes the new Eliza Schuyler. Lawson is an alumnus of the national In the Heights tour and played Mimi in the national tour of Rent. 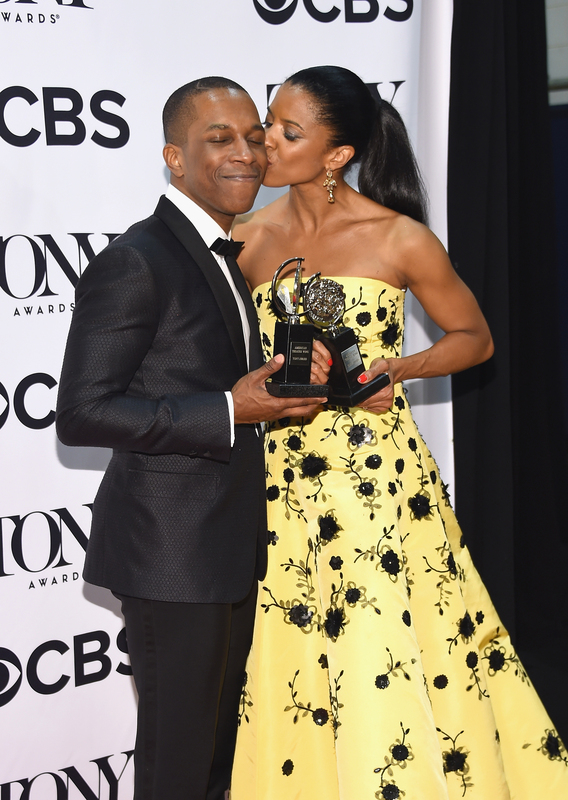 Hamilton’s Leslie Odom Jr. gets a kiss from co-star Renee Elise Goldsberry after they both won Tonys in June. UPDATE, July 15, 2016: Both Renee Elise Goldsberry (Angelica Schuyler) and Daveed Diggs (Marquis de Lafayette, Thomas Jefferson) are departing. Diggs’ last performance is July 15 and Goldsberry is reportedly leaving in the fall for the new Netflix science fiction series Altered Carbon. You can hear Diggs on the new clipping. EP Wriggle. Also worth looking forward to in the TV space: the PBS behind-the-scenes look at the show on Great Performances. The documentary, entitled Hamilton’s America, will be arriving this fall, but PBS has yet to announce an air date.